It’s easy to forget Bushwick’s Latin American influence when surrounded by yoga studios and artisanal coffee shops. But if you want food that speaks to the neighborhood’s history, head to Arepera Guacuco, a lively, family-run Venezuelan restaurant serving food so fresh and flavorful you’ll think you’ve just traveled to South America -- all without leaving Brooklyn. You’re here for the arepas, of course, which are small patties made from ground corn and stuffed with fillings like sweet plantains, black beans, and different kinds of meat. 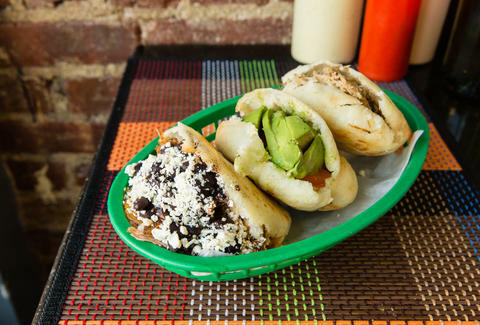 The dish dates back to the indigenous people of Venezuela, and even though Arepera Guacuco hasn’t been around for decades, the arepas don't taste like some Bushwick-ified, ready-for-Instagram take on the traditional -- these are real arepas. The Pabellon ($8) is a fan favorite, packed heavily with shredded beef, white cheese, plantains, and beans; but the $7.50 vegetarian option, filled with slices of avocado, Guayanés cheese, and a massive amount of plantains, is just as good as the meaty options. No matter the order, the highlight of this Venezuelan sandwich is the arepa itself, which is puffy yet sturdy, holds all your fillings in without breaking apart, and has a comforting flavor similar to cornbread. Don’t forget to add on a generous portion of the house-made avocado cream sauce to each bite. In fact, just ask your waiter to bring the massive bottle over to your table. Ciera Velarde is an editorial production assistant at Thrillist who is determined to try all the Latin American restaurants in Bushwick. Follow her culinary quest on Instagram.